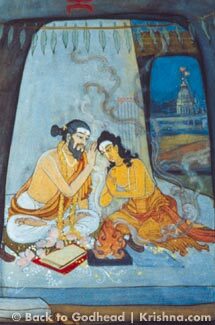 This little-known holy place played a major role in the inauguration of Sri Chaitanya Mahaprabhu's sankirtana movement. 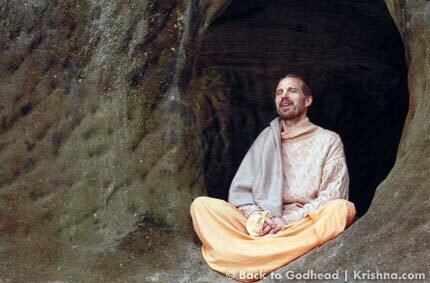 Many years ago, during Karttika I briefly visited Kanai Natashala, in West Bengal, with a group of devotees and fell in love with its seclusion. It is surrounded by a dense jungle called the Jharikhanda Forest. 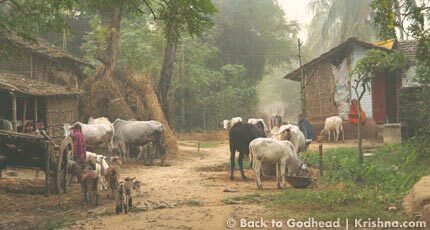 Five hundred years ago, the forest animals here miraculously chanted Krishna’s names together under the influence of Sri Chaitanya Mahaprabhu. He is Krishna Himself in the role of His greatest devotee, Radharani. 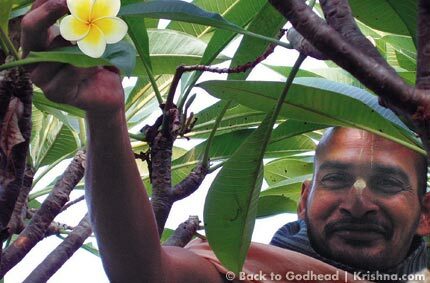 The jungle is still an untouched wilderness of ornamental trees (the tamal and ashvattha), fruit- and flower-bearing trees (the chico, mango, golden champak, kadamba, and malati), and trees with medicinal properties. Kanai Natashala lies atop a tall rock formation and overlooks the majestic Ganges. Wildlife abounds. 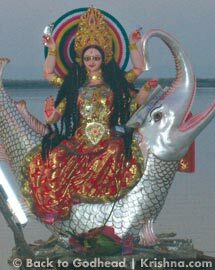 The Ganges is inhabited by dolphins, and the jungle by jaguars and snakes. 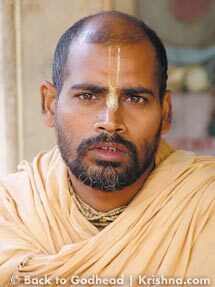 In late 2005, I returned to Kanai Natashala with an assistant and stayed there for Karttika. 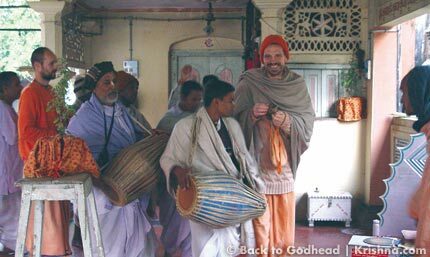 After a six-hour Jeep ride from ISKCON’s world headquarters in Mayapur, where we crossed the Ganges twice (once by bridge, once by ferry), we arrived and at once felt fascinated by the calm atmosphere. Kanai Natashala now has a new ISKCON temple, and behind it, on the bank of the Ganges, a wonderful guesthouse. The devotees have a bathing place on the river, and the villagers also come there to bathe. 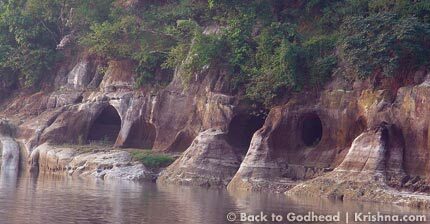 The bank is beautiful, with steep rocks and crocodile caves; however, there is nothing to worry about, since the crocodiles do not live there anymore. Now one can peacefully chant inside the caves. 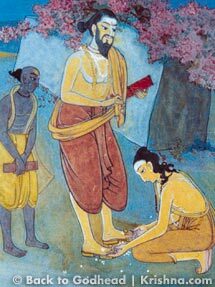 What makes Kanai Natashala significant is its connection with Sri Radha-Krishna and Sri Chaitanya Mahaprabhu. According to local tradition, it is considered to be gupta Vrindavana—a hidden replica of Krishna’s holy land. When Radharani wants to be alone with Krishna to relish His sweetness and intimacy, She comes here. And it is the seedling place of sankirtana, Sri Chaitanya Mahaprabhu’s ecstatic movement for the congregational chanting of the holy names of God: Hare Krishna, Hare Krishna, Krishna Krishna, Hare Hare/ Hare Rama, Hare Rama, Rama Rama, Hare Hare. 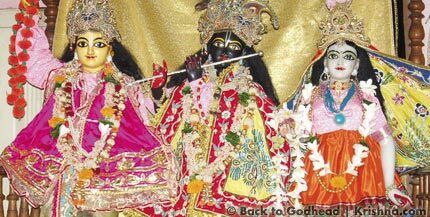 The Lord then cried and recited beautiful verses about Krishna, absorbed in sentiments of ecstatic love. His body became covered with dust because He rolled on the ground, loudly calling in distress, “Where did you go, leaving Me behind, My dear Krishna?” He became greatly agitated in ecstatic love of God and floated in the ocean of devotional feelings of separation from Krishna. His students pacified Him with great care. This feeling is required to meet Krishna. When we feel separation in this world, we become sad and troubled because we cannot fulfill our own desires for satisfaction. But feeling separation from Krishna is different. It awakens in those who have a desire to please Krishna. When one feels separation from Krishna, something wonderful happens. Externally, the Lord may not be present, but through those strong feelings, He becomes present in the heart. It is something that needs to be experienced to be understood. This reminded me of the boatman in Lord Rama’s pastimes. When Rama, Sita, and Lakshmana came to the river that separated their kingdom from a jungle, a boatman took them across. Rama was surprised. Since when had he become a boatman? O brothers and sisters! Who wants to cross beyond the ocean of material existence? My beloved Sri Chaitanya’s ferry is taking everyone across the material ocean, free of charge. The spiritual master is the helmsman on the boat of the holy name. With His arms upraised, He induces everyone to chant. With the help of the wind of divine love, all living entities easily cross the material ocean. Kanai Natashala is a special place to visit to imbibe the mood of Sri Chaitanya’s devotion. Just by visiting, one feels relieved from the dreadful influences of the present materialistic age. 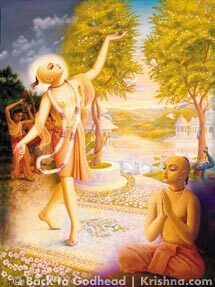 And if one can enter the boat of the holy names there, one soon will feel the transcendental ecstasy made so freely available by Sri Chaitanya Mahaprabhu’s mercy.